The imposing new home of the Yale Club, on Forty Fourth Street, al­most opposite the beautiful and costly Harvard Club, has opened the eyes of the public to the tremendous strides the college organizations have made in New York in the last few years, and has aroused comments upon the place these clubs fill in the varied social life of a big city. The enormous growth in the popula­tion of the American metropolis during the past ten years has multiplied its ho­tels and apartment houses, so that not only the stranger, but the old resident of New York, is amazed at their number and magnificence. This same increase in population has brought into being no fewer than thirty five college and fraternity clubs with established quarters, which vary in point of size and scale from the finest club house in the city, the University, down to a modest suite of rooms. As yet, Harvard, Yale, and Princeton are the only colleges maintaining fully equipped club houses in New York. These three compare with the first es­tablishments of the kind in the country; but there are many other college clubs, and particularly the fraternities, which have attractively furnished quarters. Among them are the Delta Kappa Ep­silon, in West Thirty First Street, short­ly to move to the new Bryant Park Stu­dio Building on West Fortieth Street; the Alpha Delta Phi, in West Thirty Third Street; the Psi Upsilon, in West Forty Fourth Street; the Zeta Psi, in West Thirty Fourth Street; the Delta Psi, in East Twenty Eighth Street; the Delta Phi, in East Forty Ninth Street; the Phi Gamma Delta, in West Thirty First Street, and others, not to mention the local fraternity houses and clubs of the colleges in the city. The colleges which have permanent organizations, and which in, the near future will have quarters, are Amherst, Brown, Dart­mouth, Trinity, Williams, Union, and the University of Virginia. Cornell, Barnard, and the City College have rooms in which their alumni meet. The University Club is the parent of them all, and its great granite building at Fifty Fourth Street and Fifth Ave­nue is one of the architectural orna­ments of New York. It is one of the most important social institutions in the country, because it is a concrete monument of the best results of a college training and development. It stands for the university education, its dignity, and its broad influence on modern life. It is true that the club is somewhat ponderous in spirit, that the real club life is found there in little groups at­tracted by a community of interest and old asso­ciations; but the power of the organization is growing because of the pressure behind it, that pressure which is driving American universities and colleges forward at so wonderfully rapid a rate. Any man who has received his degree from a college in good stand­ing, and who has been graduated for three years, is eligible to the University Club—it be­ing understood, of course, that he can pay the heavy initiation and dues. The college clubs and fraternities maintain the spirit with which the members of some institu­tion or society were im­bued in their undergrad­uate days. Inasmuch as the "great three"—Harvard, Princeton, Yale—have developed the idea to a greater extent than the others, their clubs are the most interesting. What can be said of them, their influence on their respect­ive universities, the advantages they of­fer to their graduates coming to New York, and their position in Manhattan clubdom, may be equally true of the other college and fraternal organiza­tions in a lesser degree. Not one of these institutions has sprung up; all are the gradual evolution of years of organiza­tion and planning by the alumni of the universities, who have sought earnestly for the best means of bringing their members together, and of keeping up college interest and sentiment. 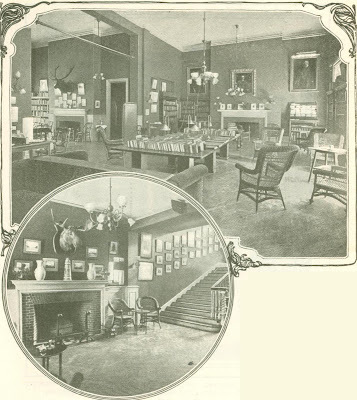 The Harvard Club, the oldest of the three, was organized as far back as 1865, as an alumni association. It was incor­porated as a club in 1887, and purchased the site of its present house in 1892. Many of Harvard's most prominent graduates are numbered among its in­corporators. The house on Forty Fourth Street, almost directly facing the new club of its old rival, Yale, is a beautiful colonial building of a style pleasantly reminiscent of the Cambridge yard. The exterior is of red brick, trimmed with Indiana limestone, and it was thought that the three story structure, with its cozy interior arrangements, would meet the needs of the organization for many years to come. But within a decade, while the building is still regarded as new, the membership has so increased that, at the last annual meeting, it was decided to acquire property in the rear of the present club house, fronting on West Forty Fifth Street, for the erection of a six story addition, which will be more than double the size of the present structure. A large general dining room, several private dining rooms, a grill room, a meeting hall, and sleeping rooms for members will be its features. The Princeton Alumni Association dates from one year after the founding of the Harvard Alumni Association. It was organized for the purpose of perpetuating the annual alumni meet­ings, and with the idea of bring­ing the graduates together several times a year. In 1886 it was changed into a club, but no permanent quar­ters were secured. The movement that gave it its present standing be­gan when some thirty members of the class of '95 organized a class club and rented a floor on Twenty Fourth Street, with such success that a year later the graduates of '96 were invited to join. The next step was to plan a union with the older club. Under the leadership of such prominent Princeton men as Adrian H. Joline, James W. Alexander, Charles Scribner, and Robert E. Bonner, this was finally consummated in 1899, and a large private house on East Thirty Fourth Street was taken for the reor­ganized club, which now has a member­ship of eleven hundred. 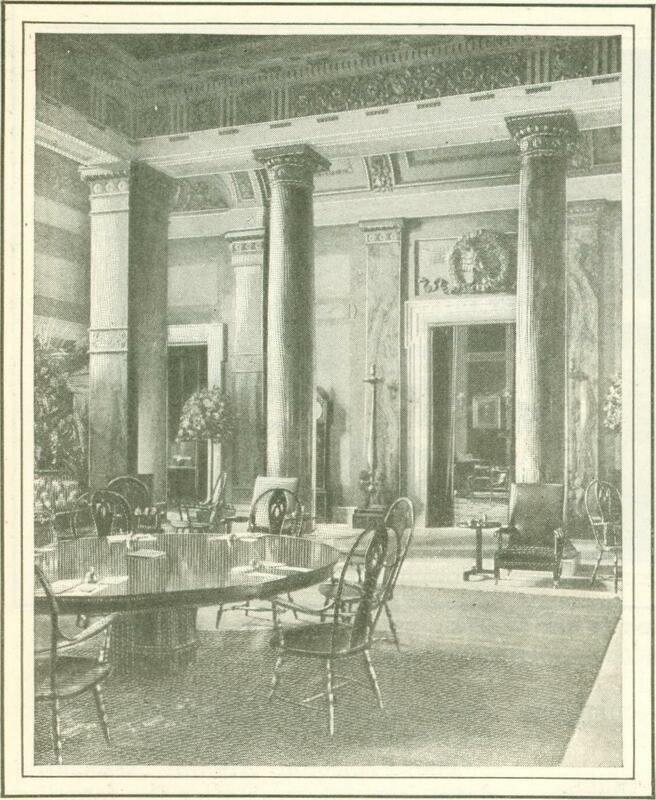 It is the new home of the Yale Club however, that makes one marvel at the prosperity of the college organizations. This eleven story building represents an outlay of three hundred and seventy five thousand dollars. It is a very handsome structure, and admirably suited to the needs of the club. In drawing the plans, the primary object was utility, but beauty has not been sacrificed, as both the interior and exterior testify. The architects, both young Yale men, have succeeded in adding a notable ornament to the "club block" on Forty Fourth Street, which already has several of the finest club and hotel buildings in the metropolis. That the "old Yale spirit" does not need the quiet rustling of the elm trees in New Haven to keep it alive, but thrives amid the noise and din of the great city, is plainly shown by the club's remarkable growth. 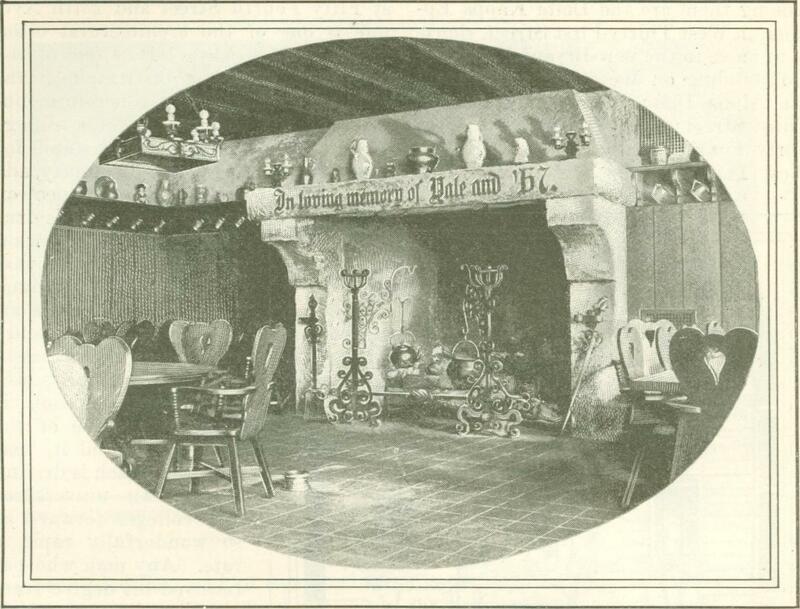 Like both the Har­vard and Princeton clubs, it originated in an alumni association. This society dated back many years, its primary ob­ject being to bring the alumni together, at least once a year, for a great Yale dinner. 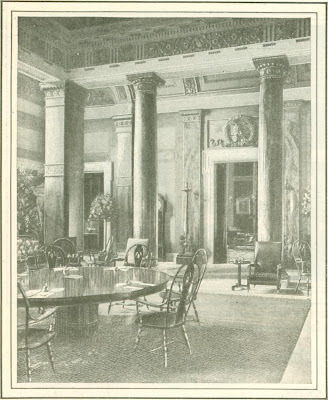 The change to the club took place in 1897, the membership starting at six hundred, and a private residence on Madison Square being rented as a club house. Larger quarters were soon needed, and last year the building committee matured its plans, purchased a site, and set about the con­struction of the new house. The work moved rapidly, and on May 1, 1901, the day set months before, the club moved into its splendid building. The expenditures on the club house have been sub­stantial, without being lavish. The upper and lower stories are faced with white marble, while red brick and Indiana limestone form the inter­mediate walls. The first floor contains the cafe, visitors' room, office, and coat rooms, and, extend­ing across the width of the build­ing, the grill room. 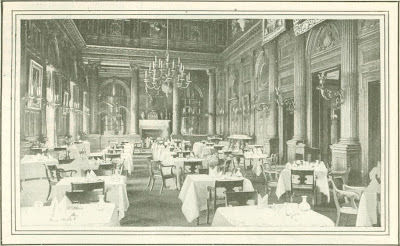 This last has excited much comment on account of its beauty and perfect appoint­ments, and it has become the regular lounging room for the younger members of the club. Its heavy Flemish oak beams and tables, the red tiled floor, the row of steins and mugs above the wains­coting, and its line of pegs where each member may hang his own pewter mug, with his name engraved on it; the clink­ing of billiard balls, and the blaze of the logs in the big stone fireplace—all these make it the place of places in the city where the camaraderie of college days may be renewed in an atmosphere that suggests Morry's." On the second floor a spacious lounging room occupies the front of the build­ing, with a library in the rear. The next six floors are divided into bachelor quar­ters for the use of the club members. Most of the rooms are leased by the year, but accommodations are always reserved for out of town members. On the ninth floor is the class dining room; which will seat about one hundred. This room is finished in white and Yale blues, and on the walls are hung pictures of Yale's famous classes and athletes. On this floor is also the council room, as well as some smaller private dining rooms. The tenth floor is entirely taken up with the general dining room, and above this are the kitchen and servants' quarters. In contrast to most New York clubs, the restaurants of these college clubs have paid from the very start. The Yale Club's profits on its restaurant, café, and cigar counter last year reached fourteen thousand dollars, and other bodies had correspondingly good showings. “How can you keep it up," the Yale man twittingly says to his Crimson neighbor, "when you charge only forty five cents for your dinners? To make money, we've got to charge fifty." The relations of the Harvard, Yale, and Princeton Clubs with their respective universities are very close, although there is no official connection. Many of their prominent members are on the boards of trustees of the universities or their various committees. The influence of such large bodies of alumni is very strong, and their support is often en­listed for important university move­ments. For instance, the Princeton Club recently secured the adoption of its proposal for a representation of the alumni in the board of trustees of the university. The clubs keep in touch with the ath­letic, social, and literary movements, and with changes in the curricula; and one at least has a committee appointed which visits the university and makes a report of its impressions and ideas at the club's annual meeting. This is done, not so much with .a view to any special action, but to keep the alumni familiar with the development of their alma mater. Varied as is the social life of New York, these clubs hold a position as distinct and certain in the club world as their universities do among the coun­try's institutions of learning. They keep alive the university spirit. They solve the alumni association problem. How well they serve their purpose is shown by the rapidity with which the clubs of "the great three" destroyed the existence of the old University Ath­letic Club, an organization which tried to take the place of a combination Har­vard, Yale, and Princeton club. The moment the distinct organizations start­ed, the triple club fell to the ground with a crash. It had no cement. The young graduate may feel at home among a crowd of graduates of his own college whom he does not know, but he was not at ease among a crowd of college strangers. So when a little spot of his own college campus was opened up, he speed­ily transferred his affections thither. Harvard Club. Library (above), Entrance Hall & Stairway (lower). It may occur to some that the Uni­versity Club must soon begin to look on these new growing clubs with appre­hension, for they seem to be encroach­ing on the field which it fills. It is true that in the last few years the number of young college men proposed for mem­bership in the University Club, soon after their graduation, has decreased, but there is little reason to suppose that this will affect its membership or its popularity. It fills a place which the smaller bodies never can usurp, and by the very inertia of its wealth and dignity it will keep that position. What these clubs mean to the gradu­ates of the respective universities, and particularly the young graduates, is shown by their success. The older mem­bers find in them a convenient place to meet the members of their classes, to renew their college days in anecdote and reminiscence, and to breathe the atmos­phere which keeps alive their love for alma mater. One evening, not long ago, five men seated around a table in the grill room at the Yale Club were talking about their classmates who had since become famous or successful beyond the expecta­tions of any one of them there. Among those of whom they spoke is a man iden­tified with one of the great railroads of the country. A few days later, the writer happened to see this man, and told him of the incident. "Where is that club, and how can I join it?" he asked. "Many times when I am in New York I would like to look up some of my classmates, but I haven't time. This is just the thing. I might have thought of it before." Entrance Hall & Stairway (lower). And this is the attitude of many of the older gradu­ates whose business brings them frequently to the metropolis. It is to the young man just out of college, coming to New York to cast for fortune in the great whirlpool of life and activity, that these clubs appeal most. To him they are veritable homes. The "hall bedroom" and the stifling odor of a boarding house have no terrors for him. He knows that, however new and strange and difficult his work may be, however unfamiliar his surroundings, there is one place where he can always find a friend, one foothold from which he can swing into the new city life with­out experiencing the feeling of bewilder­ment and loneliness that brings discour­agement and despair. As the years go by, and as his ac­quaintance becomes larger, he may reach out into other fields of club life, differing as his tastes and occupation may direct; but his college club remains the dearest, for in it there center and affection and a sentiment that never seem to die. Whether it be "Fair Harvard," "Bright College Years," or "The Orange and the Black," that comes floating to his ears from the nightly gathering of grad­uates, it carries him back to the happiest days he ever knew. From Junior Munsey, September 1901.